Finalized military reports received form the warfronts in the North for yesterday (May 29) indicate that 21 terrorists were killed and 11 others wounded in counter terrorist operations conducted in the Jaffna and the Wanni theaters of battle. Further, 15 others were reportedly killed or suffered serious injuries, according to the reports. In the Jaffna theatre of battle, troops confronted with the terrorists in the Elathumadduwal area last morning. A soldier suffered injuries in this confrontation. No details on terror casualties were available. Meanwhile, another soldier suffered injuries due to an anti personal (AP) mine explosion earlier on the same day morning. Troops engaged in offensive operation in Wanni front have captured LTTE main supply and administration base known as "Munnagam Base" located in general area north of Janakapura this morning, May 29. LTTE terrorists have triggered off a claymore mine targeting police vehicles in the Vavuniya area this morning, May 29. World Tamil Movement (WTM) was so powerful and influential in Canada that even it helped host Canadian Federal Finance Minister Paul Martin and International Cooperation Minister Maria Minna both of the Liberal Party to a dinner to raise funds, May 6 2000. A journalist, the Jaffna area correspondent for Sirasa, MTV and Shakthi Tv, who had done a comprehensive coverage for the Jaffna Re-awakening trade fair and his friend were hacked to death by unidentified assassins alleged to be LTTE terrorists last evening, May 28. 6 civilians were reported killed, another 20 including a pregnant mother injured in LTTE launched indiscriminate artillery attacks towards the densely populated Jaffna , Sri Lanka mainland this morning (May 29). 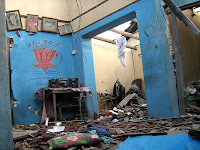 The cowardly attack targeting innocent civilians comes within hours after Army and Navy troops successfully repulsed a pre-dawn LTTE infiltration bid at the Chiraththivu islet located along the Jaffna- Mandathivu causeway.According to military report, 20 rounds of heavy artillery shells have fallen into the densely populated Kolombuthurai, Gurunagar and Pasiuura areas causing sheer tension among the civilians who are majority Tamil. Many civilian properties including vehicles and residences were also destroyed in this attack. A Catholic priest, children and elderly civilians were also among the victims suffered injuries. 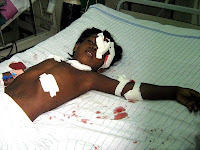 The injured were rushed to the Jaffna teaching hospital immediately. The Colombo District Court has issued a standing interim injunction informing the suspension of the implementation of the agreement signed by MP Mangala Samaraweera with the United National Party. This order was given at the interim verdict of the petition filed by former UNP parliamentarian Anura Bastian and Western provincial councilor Anil Kumara Wijesinghe. This order is effective till a verdict is made on a hearing into the case. The petitioners stated that the agreement is contrary to the constitution of the UNP and has not been approved by the working committee of the party.